New York’s finest Pizza. Most locals know that Bleecker Street Pizza serves one of the best slices in the city. What they might not know is the New York story behind how it came to be in the first place. The founder, the late Douglas Greenwood, opened up shop in 2004 committed to replicating the pizza recipe his grandma made when he was younger. Owning a pizzeria was not Doug's chosen career. He was a cop. He served for 26 years, 40 days of which were spent on "The Pile" in the immediate aftermath of 9/11. Soon thereafter, Doug developed respiratory issues that directly led to his retirement from the force. His failing health did not stop him from making his new dream a reality. Neither did the cost of grandma Maria's high quality ingredients nor the skyrocketing Manhattan rent prices. Wedged smack dab in the middle of the West Village, Doug Greenwood's cozy Bleecker Street Pizza has been serving up Nonna Maria's best ever since. 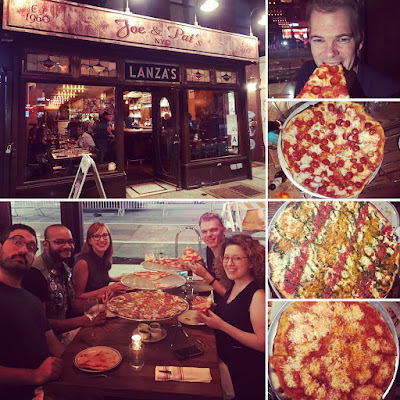 It didn't take long for everyone to notice and fall in love with the little slice joint. Crowds of people including cops on the beat, Bleecker Street musicians, NYU students, Christopher Street cabaret stars, celebrities and drunk bridge and tunnel revelers line up until 5am to get a taste. People that might not agree about much else agree that Bleecker Street pizza is worth the wait but, as of October 2018, we might not have to! Bleecker Street Pizza opened up a sit-down pie place next door! Now patrons can sit down while enjoying the delicious legacy of one of New York City's most stand up guys. 1. Maddy Mako got an awesome new haircut and I think Amadou agrees. 2. Ask Angela DeManti to tell you a story about her dad and baseball. She has like three stories that each last about five minutes and will leave you laughing and endeared to her and her father forever. 3. Andrew Fafoutakis is a Frank's RedHot kind of guy whereas Dave Eng prefers Sriracha. 4. Carolyn Chen and Dave Eng recently returned from a trip out west and took like the most beautiful pictures. Facebook friend them and you're feed will instantly become a million times more scenic. 5. Ron Palais and I are Mets fans and hope Jacob de Grom wins the Cy Young this year. After pizza we went to a place called GROM for gelato. They even have a flavor called Creme di grom which both of us thought the other would have ordered...but didn't. I hope the real de Grom fares better when they pick the winner of the Cy Young. 6. Dan Benjamin and Laura are gonna have us over for a pizza party soon. 7. Jen MacNeil Danenberg got her husband to stay home with her firstborn to come out to support Robin in her show. 9. I included the un-intended cheese pull outtakes because, well, it was impressive.